When we last talked to Fred Kerley, he and brother Mylik were garnering headlines for their relay heroics at Texas A&M. That year, ’17, put Fred squarely in the world’s 400 focus. 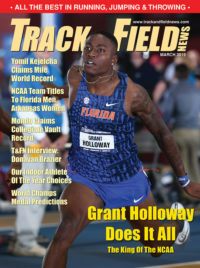 He entered that season with a PR of 45.10 and went faster than that no fewer than 11 times, topped by powerful, fast-finishing wins at the NCAA Indoor (44.85), the SEC (44.30), the NCAA (44.10, after his still-PR 43.70 in the West Regional) and the USATF (44.03). His parade of victories ended in London, where he could only muster a 45.23 for 7th in the World Championships. Last year he somewhat made up for that by earning No. 1 in T&FN’s World Rankings. Kerley has thrown himself completely into the work needed to hold onto that ranking. 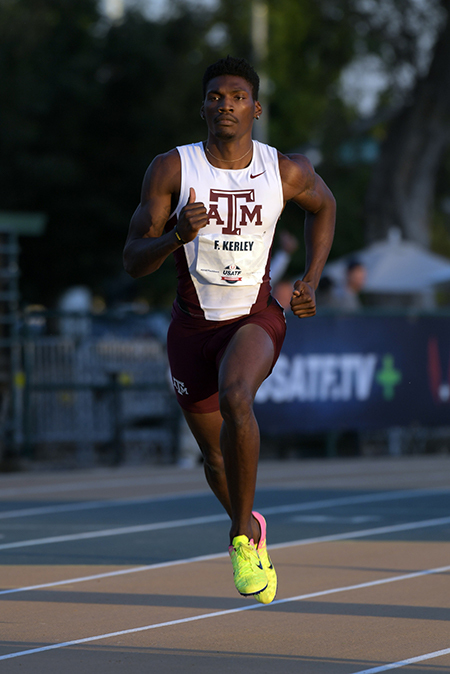 While his brother is working with another group, Fred has stayed with former A&M assistant Alleyne Francique, himself a 2-time World Indoor champion from Grenada. Often he goes through his paces alone, unless Bralon Taplin—another Grenadian—is in town. When he’s not training, he’s working on the 6 credit hours he needs to graduate from A&M with a degree in Agricultural Leadership (minors in Sports Management and History). Or he’s monitoring his investments. 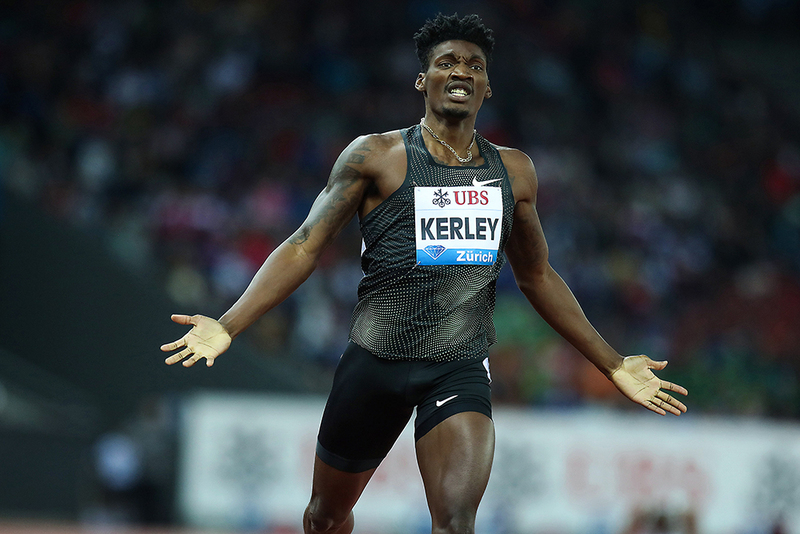 Mainly, though, Fred Kerley is grinding through his training, with an eye on making the upcoming major podiums. We caught up with him right after an early-April practice. T&FN: Do you find that your training routine has changed since your college days? Kerley: Training really hasn’t changed that much. It’s just more one-on-one training instead of with the big group. Probably the same volume, but more intense, like shorter breaks and faster reps.
T&FN: When are you planning to start racing this year? Kerley: My first race, a 200, is April 27th at A&M. T&FN: Do you feel more pressure than you did when you were a college athlete? Like you can’t go out there and just have a mediocre rust-buster race? Kerley: I really don’t feel so much pressure. It’s just I’ve got to perform at a higher level than I was in college. Flying overseas plays a big factor in performing. Whoever adjusts the fastest is most likely going to come out on top. T&FN: What’s Alleyne Francique like to work with? Kerley: He’s one of a kind. There is no one like him. He actually gets in your head to make you perform on the track mentally and physically. He pushes your body to the limit. He knows what he’s doing. He’s going to push me to 42-seconds and 19-seconds this year. I believe in him so much that I had to come back to train with him. T&FN: During practice, do you ever have light or fun moments or is it all just grind? Kerley: Both. I know when to be quiet and grind and I know when I can joke around. Francique, now 42, knows that path. A former world-class 400 man himself, he anchored LSU to an NCAA 4×4 win in ’01 after taking 2nd in the open race. He went on to win World Indoor gold for his native Grenada twice, in ’04 & ’06. Prior to the Athens Olympics, he sped a PR 44.47, and at the Games he took 4th in 44.66. After his retirement in ’08, he started his coaching career alongside Pat Henry at Texas A&M, where he helped guide Deon Lendore and Kerley to NCAA crowns, produced 4 NCAA-winning 4x4s outdoors (and 4 indoors), and mentored Donavan Brazier to his frosh year 800 win in 1:43.55. “We have a great relationship,” Francique says of his work with Kerley. It’s about communication, he explains: “I make him feel like he can do it, make him believe it.” What sets Kerley apart? “He has big goals that he sets for himself,” Francique says. “He wants to run 42-seconds. He wants to be the first person to do it. When you have that kind of a goal for yourself, you have to keep the intensity up and keep your focus up. But the competition is going out faster, and Kerley needs the tools to handle a hot early pace, Francique continues, saying, “The goal this year is to break 20 seconds [in a 200] because his PR is 20.24. If he’s coming through in 20.5, 20.6, 20.7, I don’t think he can handle it because it’s too close to his max. If he runs 19-seconds in the 200, then I think he could come through in 20-point without being uncomfortable so early. T&FN: You had a recent training trip to Grenada. What was that like? Kerley: It was a once-in-a-lifetime experience. Not only the culture, the foods and stuff, I also got to get the raw grind. The fresh food I was eating, the fresh vegetables, the fresh fruit. I got everything nutrition-wise from Mother Earth. Not only that, the training days were wonderful. I got to train in rain when it was hot. I actually put everything into the training sessions over there. It was just wonderful. T&FN: What were you doing when you weren’t training? Kerley: Just probably chilling outside by a coconut tree and going down to the market places where you can see the culture of Grenada. Or going to the beach area. Clear waters down there. T&FN: What was your favorite food? Kerley: Favorite food? I ate everything. I ate some dolphinfish. It’s really not dolphin. It’s a local fish called the dolphinfish. I ate some pasta from the countryside, fresh lettuce. I basically ate everything from the country, so I really can’t tell you which food was best. I ate everything, and everything that I ate was good. T&FN: Last season was somewhat unusual, in that you ranked No. 1 in the world in the 400 despite missing nearly two months in the middle of the season. What happened? Kerley: Actually, I pulled my hamstring in training. I didn’t tell anybody because if I step on a racing platform, I should be 100%. If not, I’m not going to step up and just run. So I took 2 months off to recover from what I was dealing with and I came back and ran in Birmingham and won and then won Zürich. T&FN: Did those August victories—which helped you to clinch the No. 1 World Ranking—help make up for being down? Kerley: Yeah, it totally made up for it. It was wonderful that I made it back and got back to my groove, winning things. T&FN: Looking back on your breakout year, 2017, you were on top of the world until you finished 7th at the World Champs. How does that motivate you now? Kerley: I think 2017 was a wonderful year. My first year on the big stage. I’ll say this, the World Championship, I don’t think anything awful about it. I wish it were a month or so earlier. I would have been fine, but I’ll take 7th-place and run with it. It just motivates me way more to get back to that place and get a gold medal. It motivated me a lot, so I’m pushing myself daily to get to back to that position and hopefully I can come out on top this year. T&FN: That was a long year for you, with college races starting in December and having to perform all the way into August. 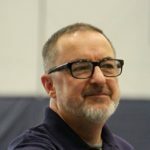 Was it simply a case where at the start you didn’t have any idea you would be successful enough to go all the way to Worlds? Kerley: Not necessarily. I set goals for myself at the beginning in 2016. After summertime when I didn’t make the Olympic Trials, I came back and started working and started doing everything I needed to do in the gym to get healthy. You know? And 2017 was my healthiest season of track & field of my college career. T&FN: Now that you’re a pro, you race a lot less. Do you feel the difference? Kerley: I’m feeling totally different, but the lack of races can play a factor in certain situations too. So that’s why in training we simulate the race pattern every time. T&FN: What is your race pattern? How do you mentally break down the distance while you are racing it? Kerley: I don’t really break down my races. I only think about what I need for that day and what my coach wants to work on that day. T&FN: So for you is the 400 one long sprint now instead of planning to cruise for 150 and then kicking? Kerley: Yeah, there’s no such thing as cruising. The 400m is a sprint. If I compare my race in Shanghai last year and my race in Rome, in Shanghai I lost the race the first 50m because by the time I tried to get back, they were all gone. They got out in the first 50m [Kerley finished 4th in 44.71]. So therefore in Rome I went off and I had some energy and I barely won that race [44.33]. It’s a totally different race in the 400 because I can’t cruise like I did in college, the first 50, the first 100, and then bring her home. The boys on a professional level are ready to go that moment. You can’t chill. I can’t do anything like I did in college. It’s totally different. T&FN: Going back to your beginnings, when did you realize that you might have a gift? Kerley: I’d probably say my senior year of high school. I would’ve probably been playing football somewhere instead of track. But my senior year I broke my collarbone and then, because I couldn’t do what I needed to do for basketball, I sat out the whole basketball season until 8 games were left. Then I finished that out and I started running track more seriously my senior year. I didn’t have the greatest times. I ended up running 21.56 and also a 46.9 on the 4×4 at the State Champs. T&FN: And you only ran the open 400 once in high school, a 52.20 in ninth grade. What’s the story there? Kerley: The coaches threw me in it like two minutes before the gun. They said, ‘Oh, you got to run a 400 just for training purposes.’ So I’m like, ‘I wasn’t getting ready for something else now because I’ll run the 4×4 if someone doesn’t want to run that race.’ And he said, ‘Oh, you got to get a 400 in somehow,’ so he made me do the 400. T&FN: Those senior year times were promising, but not enough for a scholarship? Kerley: I had to walk on to South Plains Junior College and that’s when my history of the 400 really started, that’s when I actually got 400m training. I ran a 46.38 that year. The following year, I ended up tearing my quad doing the 4×1 at Texas Relays. At Texas A&M my junior year I was somewhat healthy but not completely. I was still recovering from my quad injury and I ran a 45.10. My body broke down after that race. My senior year everything hit perfectly, everything came at the right time when I needed it the most. T&FN: Last time we talked, you said you were still learning. Kerley: Yes, and I’m still learning because I think the minute I stop learning, that’s the minute I won’t ever progress again. T&FN: What are the most important lessons you’ve learned as a pro? Kerley: You gotta sleep. You’ve got to take the wins with the losses. And you’ve got up days, you’ve got down days. But you’ve got to keep on going and you can’t ever get down on yourself because there’s always a next race. You’ve got to be prepared at any time to go. You’ve got to take care of your body at the highest levels. You can’t ever stop, because your body’s your temple. You’ve got to keep on going no matter what. T&FN: The 400 used to be owned by the United States. There were years that 8 of the top 10 were Americans. Now you made it back to the top last year. Do you think the United States is coming back compared to other countries? T&FN: On the world level, who’s the most dangerous? T&FN: When you’re racing, what’s your favorite lane? Kerley: I really don’t have a favorite lane because if you look at history, anyone can run fast out of any given lane on any given day. The World Record was broken in lane 8. Michael Johnson ran fast in lane 3. Any given day I can run in any lane. T&FN: Lately we’ve been seeing some of the top 400 guys running some really fast 200s: not just van Niekerk at 19.84, but Isaac Makwala 19.77, Steven Gardiner 19.75, Michael Norman 19.84. Is running a fast 200 now critical to running a fast 400? Kerley: In this day and time? Yeah. Look at it. Michael Johnson had a fast 200 and a fast 400 and now you’re getting us younger guys now, some of us running in the 19s. So if I ever get into the 19 bracket, the 42 is right there. If you run faster in the 200, most likely you’re going to run fast in the 400 if you’re built that way. The history of quartermiling has seen 18 different men break the 44-second barrier. Of those dozen and a half, Fred Kerley isn’t (yet?) quite the fastest, but he is both the tallest and the heaviest; the former by just a fraction, the latter by a significant 12lb (5kg). This chart is ordered first by height. If 2 athletes are the same height, then they are ordered by weight. If still equal, the one with the fastest PR is listed first. Because of the inexactitude of conversions, people with the same English-measure height may have different metric figures, depending on which system the measure was taken in. Figures obviously also vary with time; these are the best-known numbers at the athlete’s prime. T&FN: Looking at the 10 top 400 guys in the world, you’re more than 30 pounds heavier than any of them. You’re the biggest guy out there. Is that an advantage? Kerley: I don’t think it’s an advantage and I don’t think it’s a disadvantage. There’s no ideal track body. There’s no telling me you think that there is an ideal track body. Just like Usain Bolt beat the odds because they said he was 6-5 and the shorter guy had more turnover. Bolt had more turnover and look, he ended up breaking the World Records. T&FN: In 2016, when you were sitting home from the Olympics, I’m sure you had to have seen Wayde van Niekerk’s 43.03 World Record. Did that shock you when you saw it? Kerley: I don’t think it shocked me because he’s a talented young man. At the end of the day it’s track & field. You never know who’s going to show up on any given day. T&FN: Who do you think will be the first man under 43? T&FN: What will it take? Kerley: Focus, be myself. Have fun, enjoy.